Brookside Vertical Mobile Rack with 12 Pivot Brackets - GS Direct, Inc. 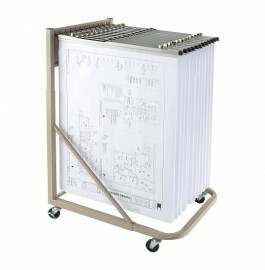 The Mobile Stand is perfect for your blueprint files that require mobility, accessibility and ease of use. Heavy gauge steel telescoping channel construction adjusts in height and depth. Includes 12 chrome plated pivot hangers that swing wide to allow easy access to drawings and rack features four 3" ball bearing swivel casters with a locking feature for the rear casters. Will accept clamps 18" to 42" in length (sold separately) and sheet sizes to 60" long.